Arm yourself with one of his woks and his book and you can soon be stir-frying, steaming and sizzling your way to delicious, mouth-watering meals that the whole family will love! Well, before I learned how to cook my father taught me how to eat. How to decipher ingredients using my palate (he wouldn’t let me watch him cook, but would then test me on what was in a dish! ), how to tolerate first then eventually enjoy the heat of a chilli, and how to always remain curious when it came to eating. It was a natural progression after that. I come from a background of chefs, but didn’t really step into my role as not just a chef but also a teacher until my mid-twenties. But ask anyone who went to uni with me and whilst everyone else was ordering cheap take away I was buying chicken wings from the butcher. I have always preferred cooking something simple, with real ingredients than the alternative fast and easy take away- where you never really know what you’re eating. What’s your top tip for home cooks just discovering Chinese cookery? Organisation is key! Chinese food is 90% preparation and only 10% actual cooking. Planning ahead, making sure everything is chopped and ready will go a long way to starting you off on the right foot. I would also emphasise that a great dish doesn’t require a ton of ingredients, as long as whatever you use is used thoughtfully. What are your essential pieces of kitchen kit for Chinese cooking? In order to make a great meal all you really need is a good, properly seasoned wok, a utensil to stir fry with that won’t damage your wok and a sharp knife. Everything else is a bonus! Kit your kitchen out with the right wok and accessories from Jeremy’s School of Wok range. Developed and endorsed by Jeremy, the School of Wok range is ideal for preparing all sorts if Chinese dishes. How do I choose between a non-stick and uncoated carbon steel wok? Basically it boils down to how much time you have to clean and care for your wok. Non-stick woks require a bit less time when it comes to care, so if you’re worried about time being a factor or are new to the kitchen perhaps start off with a non-stick until you feel confident. That said, I am partial to an uncoated carbon steel wok myself as the smoky flavours you can create with them are pretty unmatched. Also, once you season your wok properly so your food doesn’t stick, it only take a few extra minutes of care each time you use it, so in the long run I think it’s a worthwhile investment. Why do I have to ‘season’ a non-coated carbon steel wok? Seasoning your wok helps to create a non-stick surface naturally, making it easier to cook with, without burning your food. Take a look at our video to find out more about seasoning your carbon steel wok. I’m going to cheat a little bit here and say that my favourite ‘ingredient’ is a classic Chinese marinade; soy sauce, sesame oil and a pinch of sugar. I always tell students if they want to guarantee their food tastes Chinese, this classic marinade will do the trick. The wok clock is the key organisation tool we teach every single student who passes through our doors in the school. Wok cooking is a very quick process, so by setting up what we call a ‘wok clock’ using the face of a plate like the face of a clock- ordering your ingredients from 12 o’clock and then going round, you can eliminate the time it takes to go back to your recipe and see what comes next, thereby lowering the risk of burning anything and also allowing yourself to really enjoy and get into the cooking process. 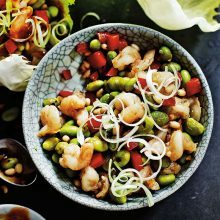 What are your top tips for stir-frying? Organise yourself before you start. 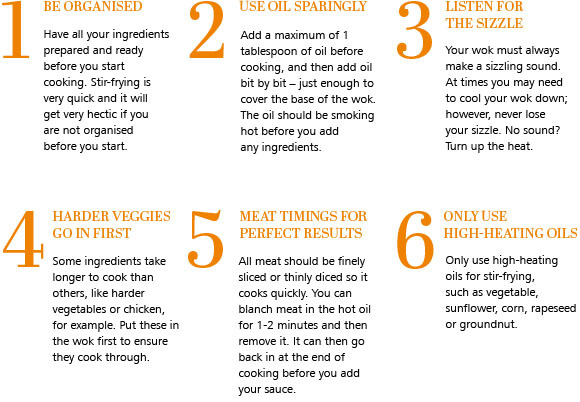 Add a little bit of oil at a time, just before putting in each new ingredient, for a crisper, healthier, less greasy stir fry, and make sure to never lose your sizzle! 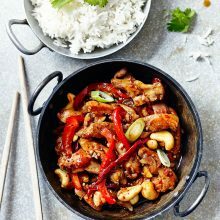 What’s your favourite recipe from your book, Chinese Unchopped? There is no way I could choose just one! I will say however that the Sichuan Chicken Stir Fry is a classic, and one of the most popular dishes at the school. And the Venison and Broccoli Stir Fry is something people don’t think of when it comes to cooking venison, created for my wife who doesn’t eat beef. You can substitute rib eye for the venison as well if you like- it’s just as tasty! 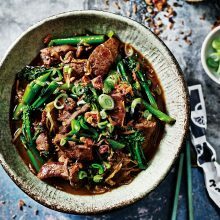 We’re delighted to be able to share a selection of Jeremy’s delicious recipes from Chinese Unchopped, including Jeremy’s Venison and Broccoli Stir Fry and Sichuan Chicken Stir Fry. TIP: To devein a prawn, use a small, sharp knife to make a slit along the middle of the back to expose the dark vein, then pull it out. Alternatively insert a toothpick roughly three-quarters of the way up the back of the prawn and pull the vein up and out of the prawn. Can’t find Sichuan peppercorns? Swap them out with a mix of crushed juniper berries and chilli flakes. TIP: If you’re a keen chilli eater and fancy something with a little more punch then throw in a mixture of different types of chillies here: dried or fresh, whatever you can get your hands on. 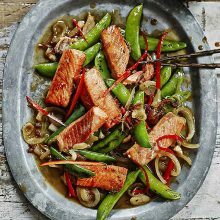 TIP: The best way to turn the salmon (or any fragile ingredient) in the wok while stir-frying without breaking up the delicate pieces is to use a fish slice, lifting up and folding the ingredients gently from underneath.